Gill phoned a few times this morning saying that she had had a few seizures around 6-00am but was okay. After breakfast the nurses sat her out in a chair for a while but unfortunately she had a seizure and banged her head, the side of her right knee and her right forearm. I arrived for visiting at 2-00pm and Gill was fast asleep and looked really settled so I decided to let her sleep. She was still sound asleep at 3-20pm when I decided to leave, I wrote her a note and left it so she could read it. At 4-00pm Gill phoned me up, she was crying and really upset that I didn't wake her so I said that from now on I would wake her if she was asleep when I arrived. Lindsay and I visited her at 6-30pm and she was really tearful. She was also a bit down because her doctor said she'll be in for another week. She seemed reasonably cheerful when we left at 8-30pm. 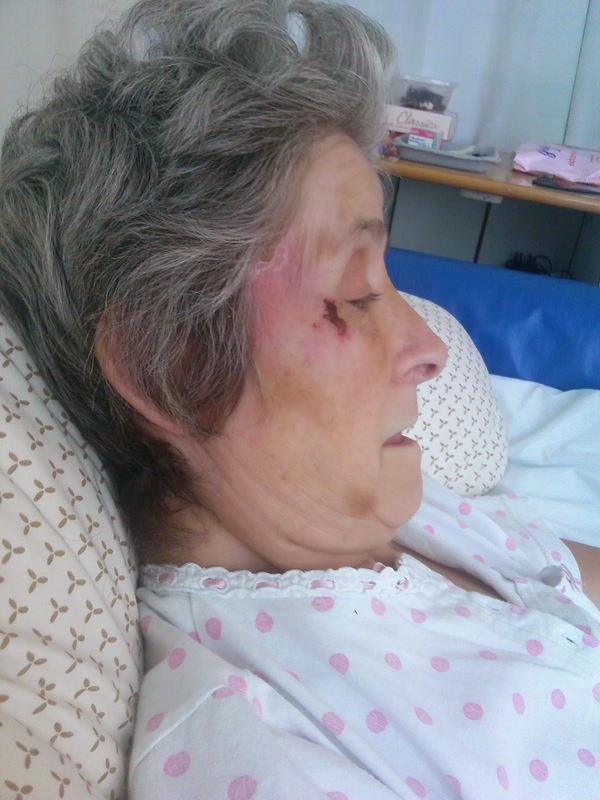 At the 2-00pm visiting Gill said that she hadn't had a seizure since yesterday morning. 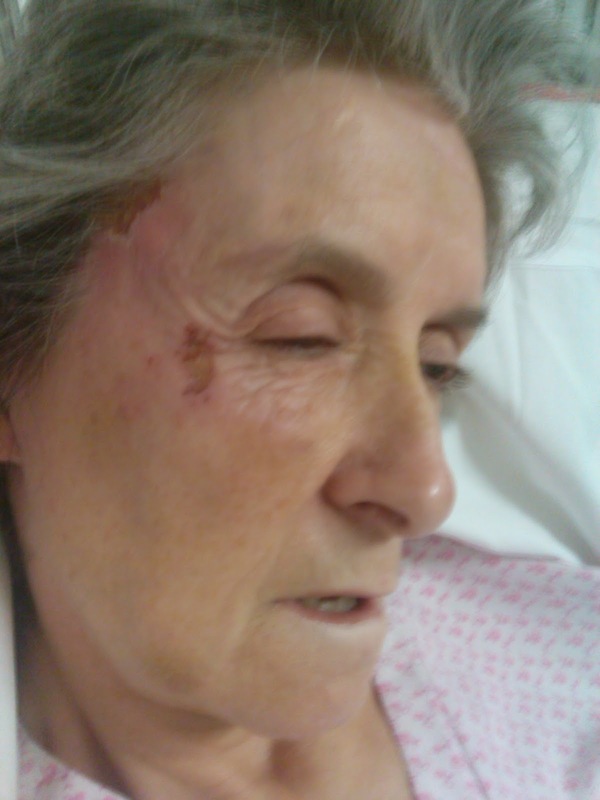 Bruising has started to come out on the right side of her face and forehead and the side of her right knee. She has also developed Conjunctivitis in both eyes. She said she had sat out for about 20 minutes but everything hurts and she is feeling quite delicate today. In the evening her friend Pilates John came to visit. 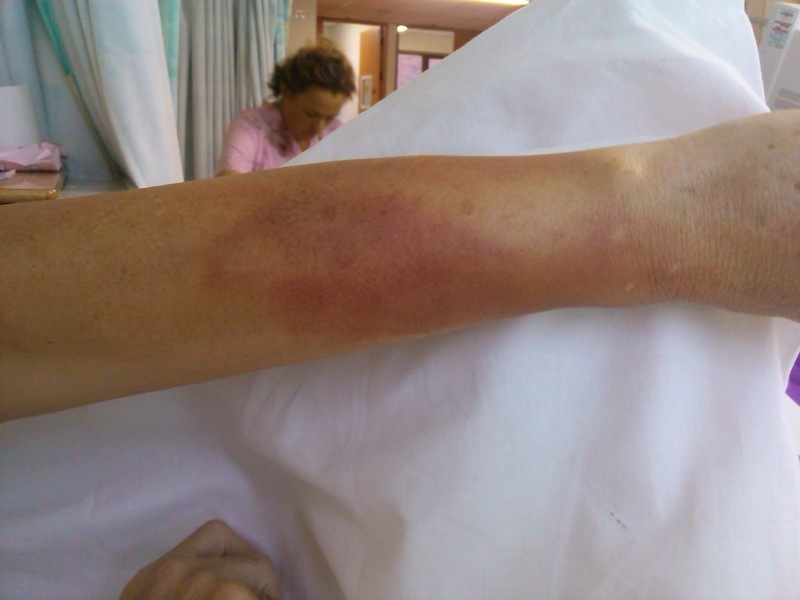 Gill woke to find her left forearm and right knee was very badly bruised, really swollen and very very painful, the nurses had a look and the doctor was called, and he decided that an x-ray was in order. While Lindsay I was visiting her in the afternoon her Doctor came to see her and said there was no broken bones just very bad swelling and bruising, Gill was pleased there were no broken bones as she has osteoporosis. 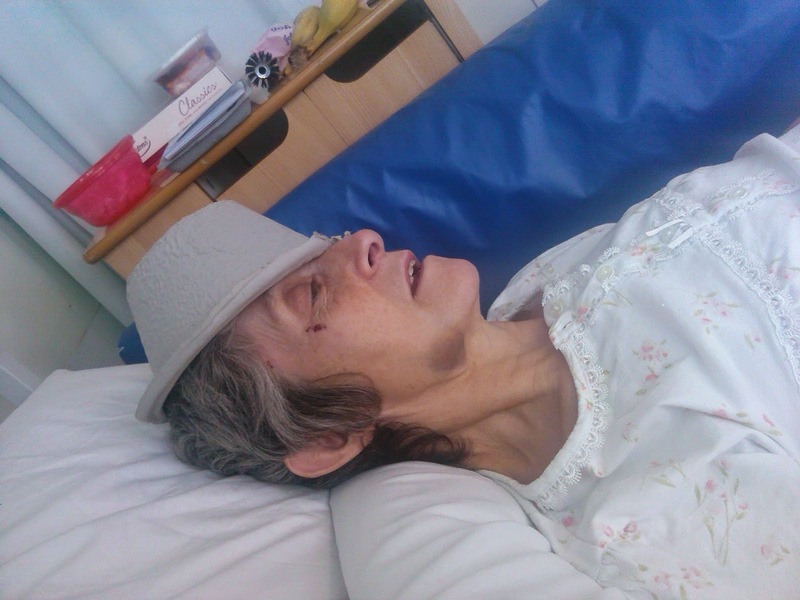 Lindsay and I arrived at visiting at 6-30pm and Gill was fast asleep, it took us about 25 minutes to wake her up, she has told us to do this, I think its a mistake as she woke up in pain, had her 10mg of Oxinorm. She was in a shed load of pain, had 4 seizures and was hallucinating. The nurses gave her some more medication and when I left at 9-15pm she was just starting to settle. is also changing on her head and face. She still isn't eating but is having some build up drinks and I'm taking in grapes and strawberries so she is getting some nutrients. 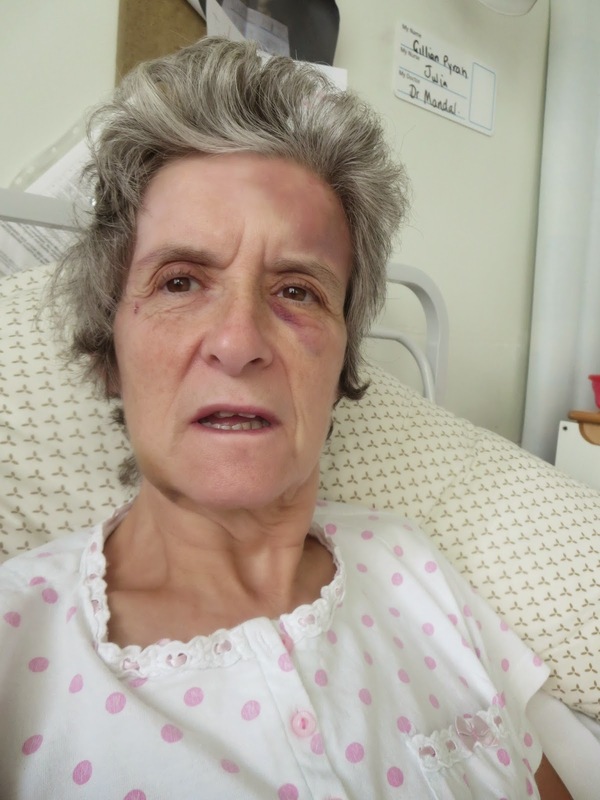 Gill had a lot of pain during the night and was sat up in bed, she thinks she passed out and with a lot of force hit her head on the trolley table with a bang, this must of sounded bad as the nursing staff came running to her assistance and the doctor was called. 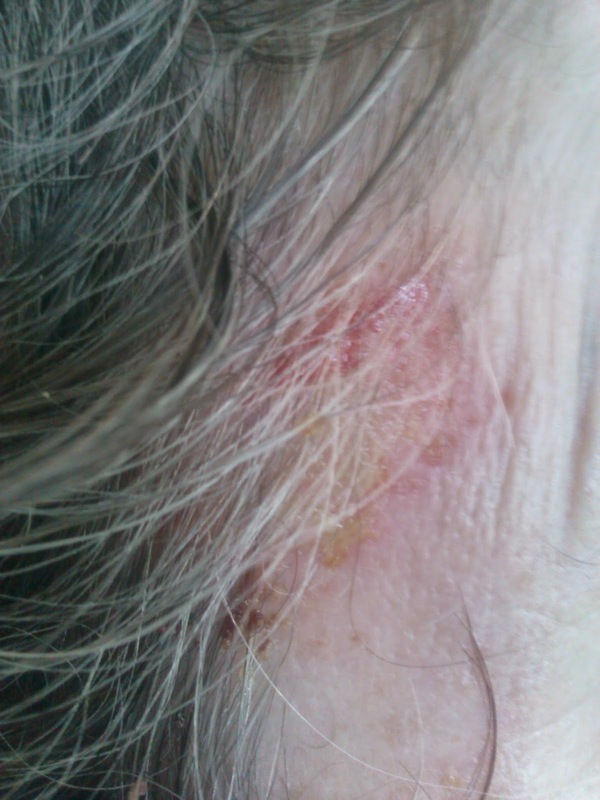 The doctor checked on Gill every hour and she also had a load of seizures, so more cuts bumps and bruises. She is confined to bed rest again but Gill is determined to get out of bed tomorrow. 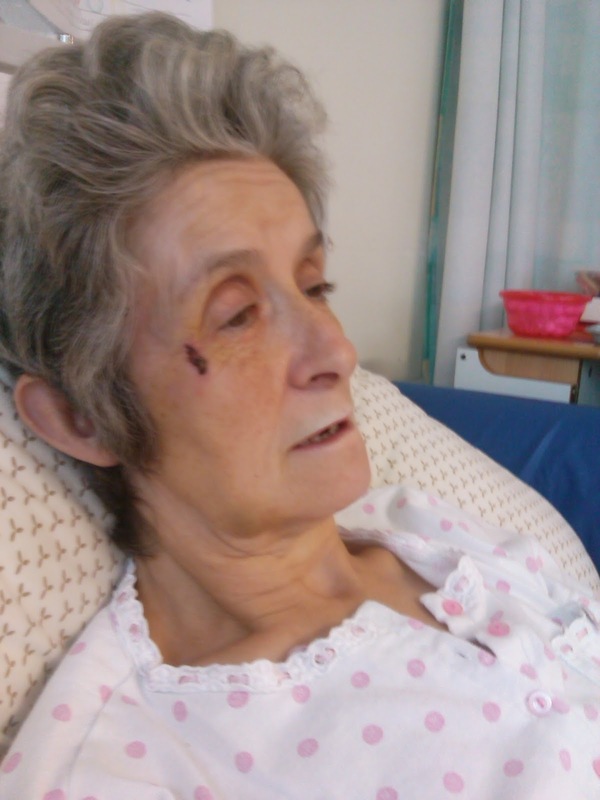 Her Doctor came to see her at lunchtime and Gill said to him, will you listen to me, she told him in no uncertain terms that she didn't want to talk to a psychiatrist which he keeps pushing for, she told him the seizures started with pain and this had been witnessed by the nurses and the doctors. So after the chat, the doctor agreed and said that when she feels ready she can use the commode instead of a bedpan and this also includes sitting out of bed and when she is ready to stand and start to walk again. She said, finally he is listening to me. At the afternoon visiting I went to get her an ice cream lolly which she asked for. The Hospital Chaplain, Jonathan, came to chat to Gill, he really is a nice bloke and listens to what you are saying and he also remembers what you have said in the past. Gill seemed to settle as the day went on and at the evening visiting, Helen, Pilates John, Lindsay and I visited. To end the evening she seemed a bit more settled. I do hope tomorrow is a better day for her. I Love You. I arrived at visiting at 2-00pm and Gill was in terrific pain with a spasm in her right leg from the tip of her toes to her groin and it had been like it for an hour. A lady patient in her bay does reflexology and she started working on her foot and an hour later all the muscles had relaxed, Gill was that relaxed she fell asleep. She was settled when I left at about 4-00pm. Gill had said that she had had a load of seizures in the early part of the day. I arrived back at visiting at 6-30pm and Gill said she had had an hour or two's sleep. Gill had a few seizures and was given oxinorm, she had a few more and she settled about 8-10pm. Gill said she woke up feeling good and had had a good nights sleep and that she had sat out of bed until about 10-15am. She went to the loo and did both she leaned forward, and she's not sure if she over balanced or passed out and bashed her head on the floor, she couldn't reach the alarm bell but a nurse came to check on her and found her on the floor. They did various tests including the eye and grip test. The Doctors also visited Gill and arranged for her to have a CT scan. Gill had some seizures while having the scan and a number of doctors went to help. A doctor and nurse accompanied Gill back to the ward, she was in and out of consciousness and also had a few more seizures. Gill was still able to get out of bed to use the commode, as she struggles with the bedpan, but a nurse stops with her. At lunchtime Gill decided to pass out and landed face first into her dinner and had gravy all over her face. At teatime she had a bit of a sandwich and some ice cream. It's Sunday and Gill's been in Hospital 3 weeks now. I arrived at visiting at 2-00pm and Gill was having a long seizure then went into a few more, she was given some oxinorm and after a while settled a bit. She's still having a tremendous amount of pain in her left arm and the Doctors decided to have it re x-ray'd and this happened about 3-00pm. Gill said she didn't have a very good night and was in quite a bit of pain and one of the nurses though it was her fibromyalgia playing up.She has it too. Gill said that she had eaten all her dinner, the first time she had done this while being in hospital. Most of her bruising is finally starting to fade and hopefully she is starting to turn the corner. Her seizures we think are caused by pain and the pain in her arm is bringing on the seizures. At the evening visiting a lady Doctor called to say the results of the x-ray were clear and that she had really bad tissue damaged, the Doctors were really surprised that there wasn't any breaks or cracks in the bones. The Doctor said, after Gill suggested it, that the arm be bandaged and a splint fitted to help immobilize the arm and hopefully reducing the pain threshold. Gill says that she had had a rough night with her arm pain and that she had had a few seizures, she also had some seizures while I was visiting in the afternoon. I had been in town shopping in the morning as Gill wanted some new pyjamas and also a fleece blanket. This should be a laugh as when ever I get anything for Gill it's either the wrong size, the wrong colour, or the wrong material. If I buy Gill 6 items of clothing she usually takes 6 items of clothing back to change them for some reason or another. At Gills bedside I straight away said if there wrong I'll change them no problem. Shock horror, she really liked the fleece blanket and she also liked the pyjamas but still she still had to try them on which she did, they fitted, magic. I didn't get to the evening visiting tonight, its only the 4th time I missed it since she's been in. Lindsay, Tracy and the grand kids visited Gill tonight. Lindsay said Gill seemed good and didn't have any seizures and that they were trying to get something for Gill's arm as it's bandaged with a plastic splint type thing on it. I got a telephone call on my mobile at about 10-35am from Dixon Ward, you don't know how many different ideas all of them not good that go through your mind between the nurse saying, good morning this is Staff Nurse so and so (then all the bad thoughts) it nothing to worry about but Gill seems very confused and upset and asks if you can come and see her for a while. So I went up to see her and she was a bit more settled when I left her about an hour later and getting ready for lunch. She apologised as she thought I was already in the hospital working on Waddington Ward as I'm a volunteer on there. She was asleep when I arrived at visiting at 2-00pm, I woke her and she seemed more relaxed, she said that she had eaten about half her dinner and all her pudding. There is a patient on her ward and that during most of the night had kept the other patients awake and really frightened another patient, Gill said she was ready to kill her apart from that she was going home today, Gill overheard this ladies doctor say that there was a problem with a blood test and she would have to stay in for another 48 hours, this really upset Gill and it really stressed her out. Gill said a member of the pain clinic had been to see her and was really pleased with what they had to say as normally they just want to give her large doses of amatripoleen or something like that. They also said that if they couldn't help her then they would also refer her to a National Pain Centre in Bath. A lady from occupational health called and put on a bandage and a splint glove over the part of Gill's left arm that had severe tissue damage from a few of the falls she has had. When I left at 4-00pm she was all settled and relaxed for a sleep. Lindsay and I arrived at visiting and she was really in a deep sleep, from just gone 4-00pm, and we couldn't wake her Pilates John arrived at 7-25pm and she was still away with the fairies and at 8-0pm we decided to leave. We left Gill a note. At about 8-35pm Gill phoned me and apologised for being asleep, typical Gill. Unfortunately Gills nurse woke her up for her 12 hour morphine tablet, hopefully she'll be able to get back to sleep. Seizures in the night, I woke to a very wet bed. I also had sores on my knee and right foot that were bleeding. Woke up feeling quite good, felt a bit sick but I did not say anything. Sat out in my chair for a while then had a seizure where I bashed myself about again, Back to bed. For only the fifth time that Gills been in Hospital I missed visiting this afternoon, I attended 2 of my Charity meetings in Dudley. Lindsay had been to see her in the afternoon. I did make it back for the last hour of the evening visiting. Gill was very tired and had not had any seizures. She had a very sore throat and a pain in her chest and thinks she has some sort of virus or infection. Sunday and she's been in hospital 4 weeks today. I arrived at visiting in the afternoon and Gill was feeling a bit better but still had a sore throat and chest. Lindsay Selina and Pilates John visited this afternoon. At the evening visiting Gill spoke to our eldest son on the phone. Barbara a good friend I had made was going to be moved to another ward and I got quite upset. Gill had a really good day and looked the best she has been in the past 4 and a half weeks, she walked a bit, sat out a bit, had visits from Dr Gupta, a member of the pain team went to see her and stated that a Doctor from the pain team would definitely visit her and would offer Gill help and support for as long as she needs it and Gill started on a long list of questions. She also had visits from David and Bev, Lindsay, Tracy, Jay Jay, Tommy Lee, Jamie Lee and as usual I was there in the afternoon and evening. A different day than Gill expected. The Doctor was supposed to come today, did he visit Gill, no. This is the same man who came to see Gill on Monday 22nd September her second day in Hospital and he said then that a member of the pain team would visit her tomorrow and he would see her the day after, Gills still waiting. Really fills you full of confidence doesn't it. Not a good day for Gill today, she went to the pain clinic expecting them to give her some answers. The bloke who saw basically said that they couldn't help her. This really upset Gill and she shed a load of tears. I visited her at 2-00pm and Debbie who lives in our street also came to see her and this brightened her up for a while. Some time just before her teatime she had 4 seizures. I arrived at visiting and Gill was very drowsy, dropping off for a minute or two then walking. At about 6-55pm she fell asleep and at 7-50pm I called it a night and went home, leaving Gill a message. The day started off a bit funny, Gill's sent me a text message says she was feeling a bit better and asked me to get her some TUC biscuits but it was in a text language she doesn't use, I learnt later that her friend Sonia in the next bed sent it for her, I arrived at visiting at 2-00pm with Gill looking and sounding better than yesterday. A little later, Blue, a sister from the pain team saw Gill and we spoke at length about her pain and medication. It was agreed that Gill will start taking 30mg of Duloxatine, a tablet she finished taking about 6 weeks ago and that her morphine tablet Oxycodone/naloxone will be doubled in strength to 20mg in the morning and 20mg in the evening. Gill was pleased with this and was much happier when Blue left. As I was leaving the ward a junior Doctor spoke to me and asked if I would speak to a consultant on Monday afternoon. Gill started her doubled dose of Oxycodone/Naloxone this evening. At the evening visiting Gill seemed a lot happier. Pilates John also visited. Saturday and its now 5 weeks that Gill's been in Hospital, a record she doesn't want. Gill started her Duloxetine this morning. Gill is feeling the effects of the doubled dose of Oxycodone/Naloxone and Duloxetine today, she's feeling very tired and sleepy and drowsy all in one. While I was visiting this afternoon Gill walked using her frame to the loo and back about 20 yards, a very good sight to see. This proves to me that she's slowly on the mend. One of the better evening visiting sessions and again she walked to the loo and back. Bad start to the day for Gill, she had 2 seizures at about 2-15am but they lasted less than 2 minutes and not so violent I am told. She is again suffering the effects of the medication drowsy, tired and sleepy. Gill is again suffering the effects of the medication drowsy, tired and sleepy, wonder how long these effects will last. At the Afternoon visiting we had a meeting with her consultant Mr Mandel. It was decided that one of the Doctor will try to refer her to a Chronic Fatigue clinic in Grantham, Gill says that they have refused her before. It was also decided that she will be going home on Thursday 30th but has got to take it very steady. Tracy's birthday today so Tracy, Lindsay, Selina and I were at the visiting tonight and Gill gave Tracy her card and a present. Visited Gill this afternoon and she looked very tired, she said that the physios had got her to do the stairs today and that she had sat out of bed until about 1-55pm, 5 minutes before I arrived. I personally think that was about an hour too long. 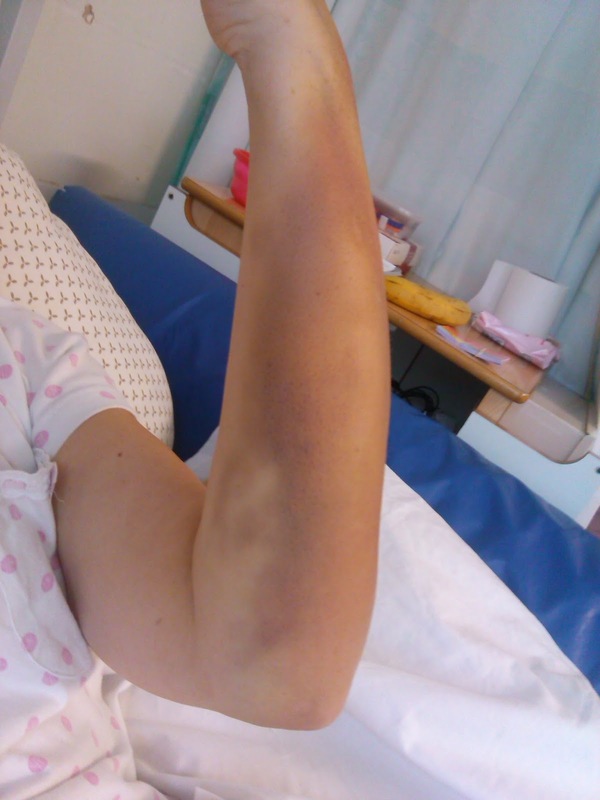 Gill is complaining that her left arm, the one she had x-rays on twice and she had severe tissue damage on it, is very tender and painful and yet more bruising is starting to come out, we think that its because she using it with her frame so she can get about. When I left at 4-00pm Gill was settled for a sleep. I'm not visiting tonight and it will only be the 6th visiting session I have missed since she's been in Hospital. Lindsay went to see her instead, thanks Nin. At visiting this afternoon Gill is very drowsy and soon gets very tired to the point of nearly dropping off to sleep as she's trying to talk to me. Gill says that she had 2 seizures at about 4-00am this morning one quiet lengthy. Gill friend, Sonia, in the next bed to Gill went home this afternoon and will be keeping in contact with Gill. Lindsay and I visited tonight and she agreed with me that we don't think Gills well enough to leave Hospital tomorrow and I went to have a chat with her Staff Nurse, and I told her of our concerns and she said that she was on in the morning and would make a comment on Gill's files and also have a word with the Doctor in the morning. I got the impression that she agreed with me in part. We left visiting a bit early so Gill could get some rest. I had a private chat with one of Gill's Junior Doctors and he explained a lot and in layman's terms and he also said that he would put the plan down on paper. We chatted for about 20 minutes and we decided to give Gill a further 24 hours in Hospital. I went to tell Gill this and she was happy about it but would only be 100% happy when she was going through the ward doors. Gill seemed happier for the rest of the day knowing that she would be going home tomorrow. The last day of the month. I arrived up at the Hospital at 3-00pm, later than usual because I know the pharmacy are a bit slow on getting together the patients medication, unfortunately I was right, it was about 5-25pm when Gills medication arrived along with her discharge paperwork. Gill said her goodbyes to the staff and gave them enough sweets and biscuits to last a month and she also said goodbye to the patients in her bay. It was time to head for home with the woman I love. Arriving home Summer saw Gill and just went loopy mad, tail wagging like mad, high fives and loads of kisses followed for ages. Summer wasn't far from Gill for the rest of the evening and neither was I. 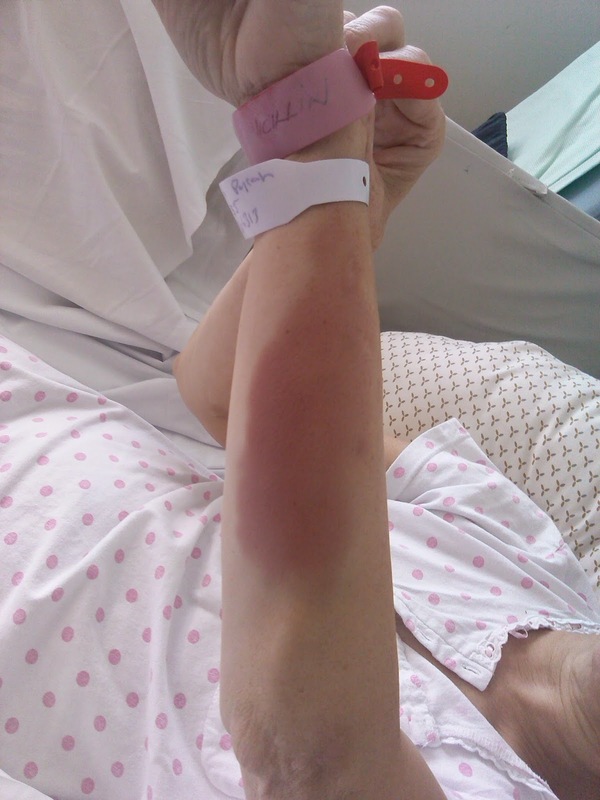 Pictures of some of the knocks, bumps and bruises I received while in hospital this time. I WOULD ALSO LIKE TO THANK THE DOCTORS, NURSES, TEA AND MEALS LADIES, CLEANERS AND THE HOSPITAL CHAPLAINS SPECIALLY JONATHAN. ALL THE FRIENDS I MADE WHILE THERE.LOVE GILL.